A bloomin' 'orrible Friday, so best head to an indoors eatery. 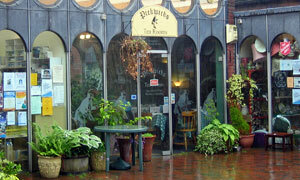 Like Mrs Pipers, another awkward apostrophe awaits at Pickwicks Tea Rooms which, as it turns out, boasts a handful of outdoors tables too, all dripping wet this June day. Do You Need A Menu?, said the waitress as we grabbed the last remaining non-soggy seats. Actually there's more space through the back. Er, yes please. Seems like a place where everyone knows your name (regulars get the smiles) and your order. Inside there's a sparsely populated dresser at one end and definitely no chips until 11:30am. Usual selection of jackets, sarnies and baguettes to order, plus the ever popular all day breakfast. My eye snagged on the omelette section. How many eggs? Four?! Make mine a breakfast special with some brown bread toast, ta very much. And lo, it was a monster eggy treat, filled with sausage and bacon and mushrooms. Yum. G's scampi and chips was also awarded an accolade of "excellent". On the side, strawb milkshake was a rinky-dink pink letdown: splash of Crusha, no ice cream. Given its off the main drag location in the unlovely named Gobbits Yard (see map), its plenty popular, pulling in a plethora of punters and pushchair pushers. Points away for the Coffee Compliment sachets in lieu of real milk that accompanied my indifferent mug of filter. Points scored for the separate pot of hot water that came with the tea, albeit in bag form. My 90 degrees of Victoria sponge could lead to an early onset of Pickwickian syndrome, and that's without the squirty cream. Best walked off with a quick stroll around the Sally Army charity shop next door. If it was a car -- Fiat Multipla. If they were passing by -- Molly Sugden.